I'm just back from 2 weeks in Australia, promoting PostgreSQL there and trying to crystallize the local community, with some success. Even though they've been mostly quiet online, there are lots of PostgreSQL users in Australia. I'm really hoping that this leads to having an active PostgreSQL.AU community again. Also, since this trip was funded by the PostgreSQL Community Fund at SPI*, I thought y'all deserved a little write-up. My main reason to be there was LinuxConf.AU 2013 in Canberra. I was recruited to speak by my friend Jacinta Richardson, so I came despite it being inland Australia in high summer. Due to a snafu with accomodations I had to stay in unairconditioned dorms, so don't ever claim I don't pay my dues for the community! On Monday, I delivered 7 Ways To Crash Postgres to the Sysadmin Miniconf. This is a humorous 15-minute presentation which gives "recipes" for the most common ways PostgreSQL users down their servers. Such as #1, "Don't Apply Updates". Y'all have applied Thursday's update release, haven't you? There was a bit of shortage of space for the Wednesday Night BOFs, so I improvised by commandeering the dormitory snooker room and holding a Pizza, Pool and Postgres BOF. In addition to getting to know around 25 of the Australian community, I explained the various binary replication configurations using pool balls, badge cords and other props. I'm told there's a photo of this online somewhere, but I haven't seen it. My actual LCA talk was on Friday, in the last talk slot of the conference. I delivered my 9.2 Grand Prix talk again (Video here), with demos. I had some technical issues (wireless, and Unity desktop), but otherwise it went well. Certainly the room was packed -- standing-room-only in one of the smaller talk rooms. One thing I was struck by at LCA was how ubiquitous PostgreSQL has become. While some attendees liked Postgres and some didn't, everyone used it. I feel like we really are "the default relational database" now. Of course, I got to see some of my friends from the other popular relational database at LCA: Stuart Smith, Monty Taylor, and Sheeri Cabral. And, of course, many of the folks from Catalyst IT I met in Wellington in 2010. Two of the more interesting talks from a "future of Postgres" perspective were Matthew Wilcox's talk on Non-Volatile Memory and Dave Boucher's talk on Transactional Memory. While both of these technologies are vaporware right now, they'll be reality in a couple years. One can imagine how Postgres might use the combination; with Transactional Non-Volatile memory we might be able to discard much of the high-overhead machinery of WAL and checkpointing, making PostgreSQL orders of magnitude faster without sacrificing reliability. I've reached out to Intel about working with our community on some of these technologies; we'll see if anything comes of it. 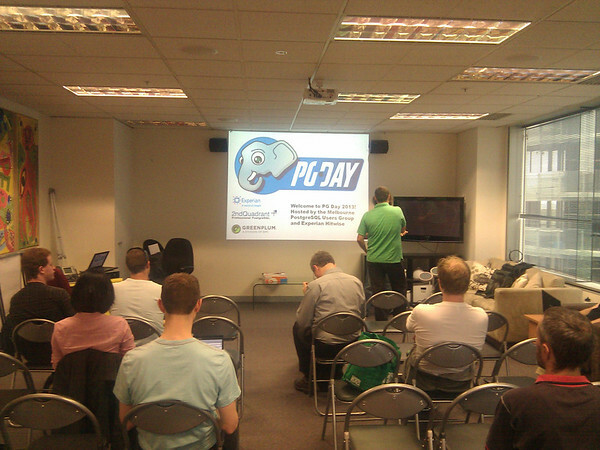 Then I flew to Melbourne for pgDay.AU 2013. Jason Godden of Experian Hitwise organized this event with the help of PostgreSQL advocacy superstar Gabriele Bartolini. Hitwise hosted it and even put me up in a hotel. As a surprise to Jason, the event was sold out, with almost 60 people in attendance, about half of them from Experian. Hopefully this will get MelPUG off to a good start! For the Melbourne crowd, I repeated 9.2 Grand Prix. I also presented 5 Steps To PostgreSQL Performance, an updated version of an old performance tutorial. The audience appreciated it (I think it was the best-attended talk of the day), but I kind of feel like I need to give it a total overhaul; the talk is a text-dense brain-dump right now. Gabriele presented on Barman and 10 Reasons to Use Postgres. One of the Greenplum guys presented on MADLib, an cool PG-native analytics library more people should know about. Jason himself presented on PostgreSQL replication options, with demos of several of them, which was pretty impressive. Overall a great pgDay. So overall a great PostgreSQL tour of Australia. Everyone in IT in Australia seems to be using PostgreSQL now, so all it takes to have a more active AU community is a little leadership. Jason will be pushing MelPUG along, and likely Rob Napier will be kicking off BrisbanePUG as soon as the city dries out. * The PostgreSQL Project maintains donated funds in several locations. The fund at Software in the Public Interest is primarily used to fund international travel for advocating PostgreSQL. If you have the opportunity to speak at an event which otherwise would have no PostgreSQL presence, but need travel funds to do so, please email me to discuss whether the community can fund you.